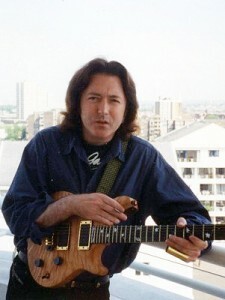 Rory Gallagher photographed with the guitar. Peter Drayne from Lisburn bought the JS Berlin Legend at auction. The guitar was custom built for Gallagher who first made first headlines with his band, Taste. An Irish entrepreneur and music fan has spoken of his delight at being able to bring a limited edition electric guitar specially crafted for Irish born blues and rock legend, Rory Gallagher back to Ireland after buying it at auction in the UK. Peter Drayne from Lisburn told how pleased he was to have bought the JS Berlin Legend which was custom built for Gallagher who first made first headlines with his band, Taste in the late 1960s before becoming a solo artist with album sales of over 30 million worldwide. Mr Drayne (59) recalled going to see Gallagher play in both the Ulster Hall in Belfast and the National Stadium in Dublin throughout the 1970s and said he felt he had to bring the guitar back to Ireland when he heard it was for sale. “I used to see Rory in the Ulster Hall and then I started making this annual pilgrimage down to the National Stadium in Dublin in January every year to see him- he was just such an amazing performer and I’m so pleased to be able bring the guitar back to Ireland,” he said. “I think guitars like this need to be preserved but they also need to be played and I’m hoping the guitar will be used on a regular basis,” said Mr Drayne who is a director of MITA Records who have recently signed legendary guitarist Steve Marriott’s daughter, Mollie. Mr Drayne explained that he only discovered the guitar was going for auction with 1818 Auctioneers in Cumbria just a few hours before the auction began but once he began bidding for the instrument made by British luthier, Patrick Eggle, he quickly secured it. “It started at £19,000 (€23,000) and I was bidding quite aggressively over the phone, going up in £500 a time and it was all over within a few minutes when I got it for £25,000 (€30,370),” said Mr Drayne who regularly attends the annual Rory Gallagher Festival in Ballyshannon, Co Donegal. Gallagher, who died in 1995 aged 47, was reknown for playing a battered Fender Stratocaster as a substance in his sweat reacted to the lacquer which caused its finish to peel but the JS Berlin Legends guitar is notable for its fine figured maple finish and mother of pearl inlay. Auctioneer, Kevin Kendall of 1818 Auctioneers said he was delighted with the price obtained for the guitar which was custom built in 1992 to suit Gallagher’s playing style and is distinguishable by its gloss finish and the initials ‘RG’ on the 12th fret of the fretboard. “We got almost twice what we were expecting to get for it so we’re very pleased - it’s definitely been the highlight of my career as an auctioneer in terms of selling rock memorabilia and it’s obviously going to a very good home,” he said.